America, meet a symbol of your enslavement. P.S. Don't bother looking for a Nativity scene on the WH lawn, since there isn't one. Since 2004, the Auschwitz Jewish Center in Oswiecim and the Museum of Jewish Heritage in New York have been sponsoring an annual two-week American Service Academies Program (ASAP) program to teach the future US military officers the Zionist narrative of the Nazi era Holocaust. This narrative (‘Six Million Died’) is the pillar of Zionist regime’s murderous policy against Palestinian people who never joined Nazi Army. Contrary to that 150,000 German Jews were part of the Nazi Army. Canadian Rabbi Wolf Gunther Plaut in his 1990 book, ‘The Man Who Would Be Messiah’ has claimed that Frankist Jews committed Holocaust. The officers are selected from West Point, the US Naval Academy, the Air Force Academy, and the honors program of the United States Coast Guard Academy. In June 2012, 14 officers visited Auschwitz as part of the ASAP program. The Jewish Telegraph Agency reported that “the officers cleared weeds and brushed in the Jewish cemetery in Oswiecim” as part of the program. Before leaving for Poland, the participants are taught Zionist narratives of Holocaust by the US Holocaust Memorial Museum in Washington and the Museum of Jewish Heritage. While in Poland, the officers tour sites of Jewish heritage, visit museums and memorials, hear lectures on Holocaust history and visit the sites of Nazi labor camps. The irony is – such pro-Israel brainwashing programs are, indirectly, paid by the American taxpayers. For example, Natasha Mozgovaya, reported in Israeli daily Ha’aretz in June 2012 that American Jewish groups received close to 97% Department of Homeland Security‘s (DHS) defense grants in 2012. In 2011, the Jewish groups had received 80% of the total grant. Israeli philosophy professor Yeshayahu Leibowitz said a few years ago that the Holocaust is new Jewish religion. Other Jews like Shraga Elam, Gilad Atzmon, Yoshua Shalev, Dr. Finkelstein and Roger Tucker have expanded the purpose of keeping the Zionists’ narrative of ‘Six Million Died’ alive, even though the plaque at Auschwitz Holocaust Museum has been further ‘revised’ from 4 million down to 1.4 million. According to the Holocaust education report issued by the International Task Force (ITF), Zionist narrative of Holocaust is taught as part of American history at schools and university campuses in 48 states and the District of Columbia. There are mor than 900 professors, certified by the Association of Holocaust Organizations (AHO), who teach Holocaust-related courses at universities and colleges levels in the United States. In addition to that kids between the ages of 11-12 are first introduced to Holocuast narratives in history, government, and English/language arts classes in most private schools. 1. ‘Night‘ by Elie Wiesel, who had been called “Liar” and “Fraud” by two of his fellow Jew academics, Dr. Norman Finkelstein and Dr. Noam Chomsky. Last month, he suggested that Israeli Mossad should kidnap Iranian president Ahmadinejad. 2. ‘The Diary of Anne Frank’ which several European academic have claimed to be a fiction. Even some portions of the diary were written with a ball point pen. These pens were not in use at the time Anne Frank lived. The member states of the ITF are; Israel, US, Canada, UK, Switzerland, Spain, Sweden, Polan, Romania, Norway, Germany, Italy, Greece, Hungary, Ireland, France, Finland, Belgium, Austria, Croatia, Argentina, Estonia, Denmark, Finland, Latvia and Serbia. Need more proof of our enslavement? John Kennedy described Christmas as an important time for citizens of all religions, without addressing the importance of Hanukkah to the Jewish community when he declared in 1962 that "Moslems, Hindus, Buddhists, as well as Christians, pause from their labors the 25th day of December the celebrate the birthday of the Prince of Peace." Hanukkah was not addressed by President Kennedy because Jews don't acknowledge JC as being a savior, but rather some type of demon who is consigned for eternity to a burning pit of excrement and that his mother Mary was a whore. 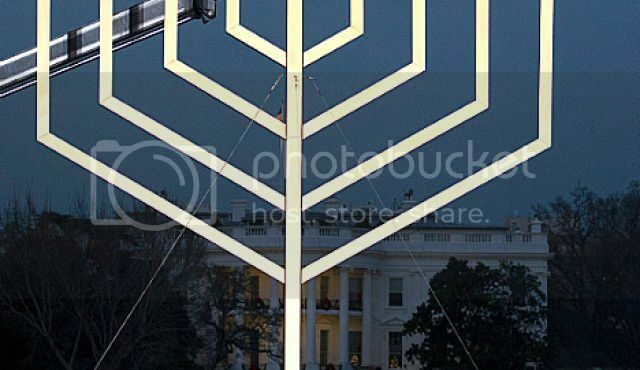 National Hanukkah Menorah 2012 in Washington, DC will be lit on December 9, 2012 to celebrate some kind of bloody conflict that had Jews butchering Syrians. Is it just me, or does Judaism celebrate holidays that are dripping with blood?